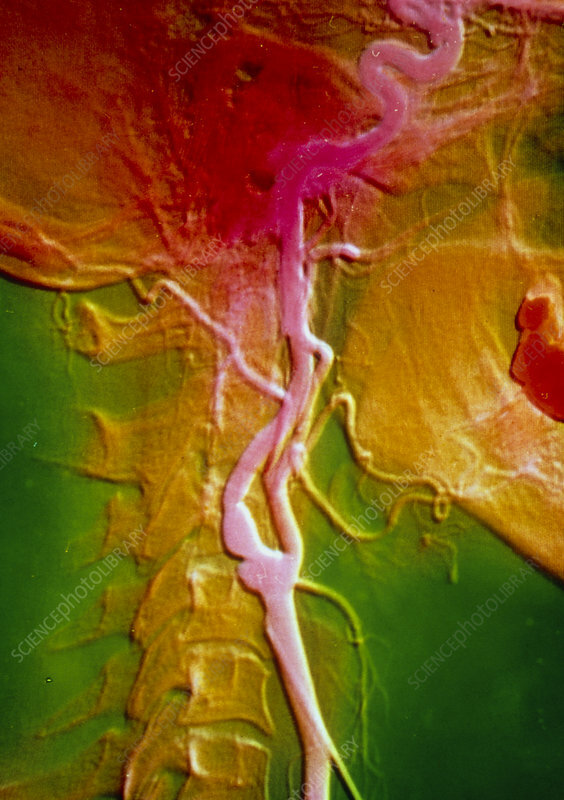 False-colour angiogram (arteriogram) of the human neck showing a stenosis (pinch-like constriction) at the origin of the internal carotid artery - the left-side branch of the common carotid artery. Here, the common carotid artery and its divisions, the internal & external carotid arteries, are coloured pink. The stenosis is due to the accumulation of atheroma plaque - a condition known as atherosclerosis, a common disease of affluent societies. Angiograms are X-ray images that are taken following the injection of a radio- opaque contrast medium into the arteries under investigation.